Hyperhidrosis affects roughly 8 million Americans and causes a tremendous amount of stress. Not only do these individuals sweat four to five times more than the average person, but they also have to worry about the constant threat of sweat — even when they aren’t even sweating. Going through life like that can be extremely stressful and overwhelming. Even worse, many people suffering from excessive sweating believe there’s nothing they can do to treat this medical condition. Fortunately, it is possible to stop hyperhidrosis and get back to living a stress free and happy life. Here are a few ways that you can attempt to control excessive sweating and hopefully stop hyperhidrosis once and for all. Iontophoresis machine therapy can effectively combat problems with excessive sweating in many people. It’s been the go-to treatment for excessive sweating in Europe since the 1960s, but now Iontophoresis machines are making major inroads to the United States. Typically, Iontophoresis therapy only lasts about 10 to 20 minutes, but if you’re suffering from severe hyperhidrosis, you might want to consider a few more treatments each week to really ensure a successful course of treatment. In the past, these machines were only available at a doctor’s office, but with a prescription it’s possible to order Iontophoresis devices for home use and stop hyperhidrosis. All you have to do is place your hands in a tub of water, then a painless electrical current will help stop the body’s sweat glands from producing sweat in the first place. Thankfully, due to advanced technology and high quality clothing materials, there are shirts and pants designed specifically to limit sweating. All you have to do is do a little research online and find what products actually work to combat excessive sweating. As long as you stock up on these quality clothing products, you should be able to at least prevent excessive sweating a little bit. Your best bet, however, remains to talk to a medical professional and consider options like iontophoresis treatments. Don’t let hyperhidrosis or excessive sweating ruin your day, week, month, or year. The time is now for you to combat this unfortunate problem and take your life back. If you want to learn more about iontophoresis machines, various hyperhidrosis products, or how to stop hyperhidrosis once and for all, talk to your doctors about your treatment options. School can be a hard time for students. Between the academic requirements, hormonal changes, and interpersonal drama, most students have a hard enough time coping. But now imagine a student has a chronic issue such as hyperhidrosis — a condition that results in chronic excessive sweating. It’s a well-documented fact that the 90% of people suffering from hyperhidrosis are emotionally affected by their ailment. In a survey, respondents even reported diminishing confidence as a result of their hyperhidrosis. For students, there can be no doubt that this is even worse. If you are a nurse or other professional working in a school, then it is important that you not only understand hyperhidrosis and it’s physical effects, but also the emotional effects as well. Here are a few tips for school employees when dealing with students suffering from hyperhidrosis. If a student tells you they are suffering from excessive sweating, don’t write it off as a quirk of adolescence or puberty. Hyperhydrosis is a serious issue, requiring hyperhidrosis treatments like iontophoresis to stop excessive body sweating. 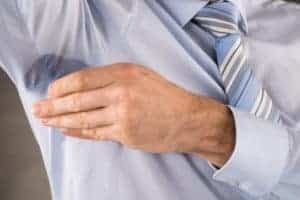 While the condition may be rare, affecting one to 3% of the population, it is still important to recognize the possibility that an excessive sweating problem might be hyperhidrosis. There can be an impulse to minimize the emotional importance of a disease such as hyperhidrosis, especially when trying to reassure a parent or guardian. Statements like “they’ll get over it soon,” or “they’ll realize it’s not a big deal when they’re older,” might be meant to comfort the parents, but if the parent suffers from the condition as well — and there is a good chance of that, since up to 50% of hyperhidrosis suffers have a similarly afflicted family member — then it can come off as offensive or patronizing. If a student is diagnosed with hyperhidrosis it is important for you to become their advocate. many teachers and staff members might not understand the condition and might inadvertently call attention to the problem, or worse, exacerbate it. Even if the student is pursuing hyperhidrosis treatments you should talk to the teachers and staff about what hyperhidrosis is and how best it can be mitigated in the classroom. School nurses can play a huge role in helping to identify students who might be suffering from hyperhidrosis. Since the ailment can be so damaging and hyperhidrosis treatments are so easy, something as simple as alerting the student’s parents to the possibility of the ailment can have huge ramifications for the student, vastly improving their quality of life.